'Early Show' Host Harry Smith Pounds Tony Snow With Pullout 'Majority' -- Or Is There? Harry Smith, who has a habit of double standards when conducting interviews, hammered returning White House press secretary Tony Snow on April 30's edition of The Early Show. After discussing Snow’s cancer treatment, Smith said "let’s go to work." Snow stated what many believe, that incorporated timetables are a stunt. An astonished Harry Smith interrupted and harshly inquired: "So the White House regards this, their, their insistence on troop withdrawals as a stunt?" Snow, who previously accused Harry Smith of sounding like a partisan, immediately backpedaled, but pointed out that the current bill is "something [the Democrats] knew was never going to get passed." After Snow mentioned that Democrats "exhausted nearly three months doing this," Smith retorted "with the support of the American people by the way." Although it is true that, according to CBS’s own poll, 64 percent of Americans do support a timetable for withdrawal, they also found when they asked if Congress should allow continued troop funding without a timetable if it comes to that, 56 percent said yes. Harry never mentioned that polling result. SMITH: The question was asked, do we want -- do the American people want troops out of Iraq? And they basically said by two-thirds majority, yes. "The Democrats in Congress have proposed to fund the Iraq war only if the U.S. sets a timetable for troop withdrawal, too. George W. Bush has stated he will veto that proposal. If George W. Bush does veto it, what should the Democrats in Congress do next: should they try to withhold funding for the war until George W. Bush accepts a timetable for troop withdrawal, or should they allow funding for the war, even if there is no timetable?" In this response, by a margin of 56 to 36 the American people say "allow funding." The relevant portion of the transcript is below. HARRY SMITH: The president's chief spokesman, Tony Snow, goes back to work today as White House press secretary after a month of cancer treatment. He joins us now. Good morning, Mr. Snow. TONY SNOW: Good morning, Harry. SMITH: You've had your surgery. You're about to embark on a series of chemotherapy treatments. How are you feeling? SNOW: Feeling great. Basically, I've spent the last four weeks healing up from surgery as you pointed out. We'll start chemo on Friday, we'll probably do about four months of chemo and then what we're really trying to do Harry is knock this cancer into remission for good. That means I'll probably be doing follow-up chemo for quite a while. But, feeling great and happy to be back at work. SMITH: We tend to dwell on business matters here. This is quite personal. Why are you insistent on going back to work? SNOW: I'm not insistent. I love my job and I feel good. You got to keep in mind, I've been through this before. I had cancer treatment a couple years ago, went through six months of chemo and worked through that as well. Harry, I think what happens a lot of times with cancer is that people get so scared when they hear the term that they think somehow your life ends. It doesn't. As a matter of fact, we live in an age of medical miracles. I've got some of the best medical treatment on the face of the earth. We think we're going to be fine through all this. And if I didn't think I was able to serve the president fully, I wouldn't be here. But I do feel that I can do my job and I'm glad to be back at it. SMITH: What does the president say? SNOW: Well, the president and I talked a bit earlier. He said, look, you stay out as long as you need to, you get healthy, and you come back. He said we could be phone buddies. But I figured he's been pretty busy, so I haven't tried burden him too much for his time. SMITH: Alright, let's go to work work, then. The president has this troop funding bill on his desk. He promises-- or soon to anyway-- promises to veto it. But he says let's all get together at the White House on Wednesday. Does that mean there's wiggle room? SMITH: Hang on. 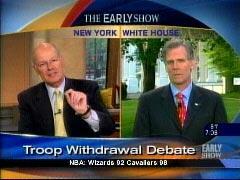 So the White House regards this, their, their insistence on troop withdrawals as a stunt? SNOW: Well, let me put it this way. That was my word. Let me be a little more temperate. It's my first day back so here's what I think it is: It is something that they knew was never going to get passed. It was never going to get passed. They knew the veto was going to be sustained, but they decided that they would go forward with it anyway. They've exhausted nearly three months doing this. SMITH: With the support of the American people, by the way. SNOW: Yes, but you know what, Harry? If you also ask, do you want to bind the general's hands, they say the same thing. It's interesting, you can ask a question and get any answer you want. The reason I was trying to give you a fuller answer is, if you ask the American people, do you to want to handcuffs our troops, do you want to do something that our generals think is inadvisable, that the enemy---that our allies think is inadvisable, that regional powers think is inadvisable, that the Iraqi people think is inadvisable, they'd probably say, wow, that doesn't sound very good. If you say, do you want to support the troops? The answer is yes. Do you want the troops home? Yeah, of course we do.